Better Buy: eBay Inc vs. Overstock.com, Inc.
One is cheap; the other is more profitable. Which wins out? On the face of it, Overstock.com (NASDAQ:OSTK) started with a brilliant premise: Buy the leftover inventory that retailers have for pennies on the dollar, and sell it at a modest mark-up over the Internet. The input costs were low, and there was no brick-and-mortar network to support either. But theory and practice are often miles apart, and that's been the case with Overstock. Thanks largely to substandard customer service, struggles with logistics, and a brand that's unrecognizable to the average shopper today, Overstock has significantly lagged fellow e-commerce competitor eBay (NASDAQ:EBAY) over the past decade. It's worth noting that neither's performance is particularly impressive, as the market returned 90% over the same time frame, including dividends. 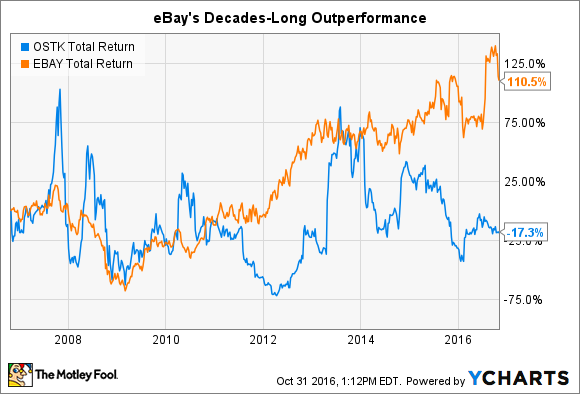 So does Overstock's underperformance make it a "Buy Now" stock in comparison to eBay? Here are three lenses we can use to answer that question. There are few things as important as cash in the bank. While an investor may loathe that cash is sitting in the bank while it could be plowed back into R&D, or used to pay dividends or buy back shares, the actual managers of the company probably know how important it is. If times get tough, companies with cash have options: outspend rivals, buy back shares, or even make acquisitions. Companies that are debt-heavy are on the other side of the equation: forced to narrow their focus, cut back on reinvestment, and potentially issue more shares. Data source: Yahoo! Finance. Net income and FCF are on a trailing-12-month basis. While eBay's size -- it is valued at 85 times the size of Overstock -- can explain part of the difference here, there is still a clear winner. Though Overstock's cash to debt load is more than reasonable, it has struggled lately to remain free cash flow positive. With such a small cash cushion, that's not a good sign. Otherwise known as a "moat," a company's sustainable competitive advantages have long been the most important variable in understanding which of my own investments have succeeded, and which have failed. At the end of the day, companies without moats will be attacked by competition to the point where margins are razor thin. While that's generally a good thing for the general public, and won't signal a death blow for the company, it's not good news for investors. eBay's key moat is referred to as the network effect. The more people are using eBay as a platform to sell their stuff, the more potential buyers are attracted to the platform. And the more potential buyers are attracted to the platform, the more that sellers will have an incentive to list on the site. It's a virtuous cycle. While the growth of users isn't what it used to be, the network effect remains robust. Overstock, on the other hand, has struggled mightily to find a moat. The company's brand has been dragged through the mud, and it is looking for other ways to gain an upper hand. The most recent has been a foray into blockchain technology. While that could pan into something interesting in the future, it's clear that the company has a long way to go to match eBay's moat. Finally, we have to determine how expensive each of these stocks are. Here are four of my favorite metrics for this measurement. Data source: Yahoo! Finance, E*Trade, Y!Charts. P/E determined using non-GAAP EPS. It's on this variable alone that Overstock gives eBay a run for its money. With a PEG ratio at half the level of eBay's, Overstock may appear to be a better deal right now. At the same time, however, it's undeniable that eBay is cheap relative to historical valuations -- and is valued at less than half the price-to-earnings ratio of Overstock. I'll be judicious and call it a draw. So there you have it. While Overstock may appear to be a steal at these prices, that will only be the case if the company can build a moat around its business. Without that, eBay is a much better choice.